Hello once again fellow scrappers & bloggers! Today I bring you a page full of both Clear Scraps & Quick Quotes goodies. 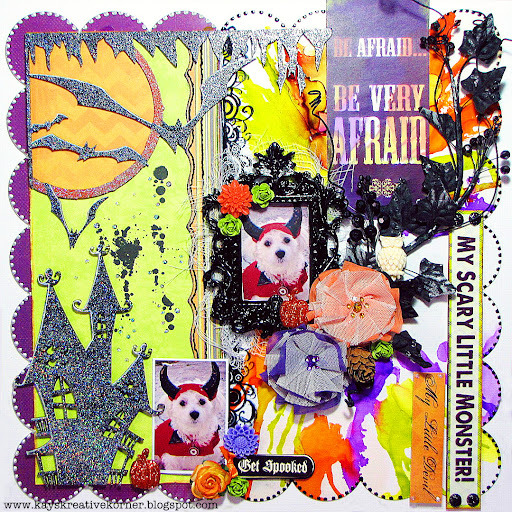 I know I'm a little late with the Halloween page--but I couldn't resist using these papers & embellishments by Quick Quotes that screamed 'Halloween'. This would be my pup Toby dressed up as a little devil for Halloween last year. I've been saving these pictures to scrap them with just the right supplies--well this was it! The base of my page is a square Clear Scraps XL Scallops shape. I've done several techniques in order to give my clear acrylic background some texture. All the papers seen on this page are by Quick Quotes. They are as follows: Halloween 100, Halloween 200, Halloween 300 & Halloween 400. The 'My Scary Little Monster' cut out is also by Quick Quotes. I hand cut that phrase from the Halloween 500 phrases. I've used an actual mini frame that I found at my local Michaels for about $1.50 to frame one of my photos. I've tucked a bit of cheese cloth behind my frame. The fabric flowers are by Webster's Pages & the black vine is by Prima called Holiday Lights Glitter Spray Black Ivy. All of the chipboard used on this page is by Dusty Attic. To give the chipboard that shimmery look I first painted it with black acrylic paint--except for the moon which I painted a deep orange. Next, I highlighted the bat wings & one side of the haunted house with a white gel pen. Finally, I inked all of the chippies in embossing ink & heat embossed them with Star Dusty transparent embossing powder by Stampendous. I punched a thin trim with my Martha Stewart Cherish punch. I then did a bit of hand stitching to further define my punched trim. I also dressed up the entire border of my page with dots of Liquid Pearls White Opal & Enamel Accents in Black. I've distressed the edges to a few of my papers and inked them with Mango Mai Tai Chalk Ink by Quick Quotes. Half of my page is actually see through--since the base is acrylic. I've inserted a white card stock behind my page so that the texture I gave my background can be seen better. These random splatters were made with alcohol inks & a can of compressed gas duster! To see a quick tutorial on this--feel free to check it out here. I used the following alcohol inks on this page: Purple Twilight, Sunset Orange & Citrus. I also did a bit of stamping on my acrylic base. Those bold black swirls seen in this photo is actually a stamp. I've used Jet Black Staz On to stamp onto my acrylic. Always remember to use a permanent solvent ink like Staz On when stamping on acrylic. Using another kind of ink will cause your image to smear. Make sure you stop by the Clear Scraps blog & participate in the blog hop in accordance with Quick Quotes! Thanks to all of you for stopping by! I hope this page inspired some of you to experiment with acrylic. Have a great rest of the week. Simply adorable pup! Love your layout! So sweet! I think your pup looked awesome and the playful layout is perfect for the subject.